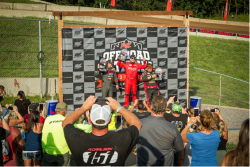 Andrew Carlson of Carlson Motorsports earned three podium spots at the ERX Off-Road National in Elk River, Minn., on July 13-14—stacking up a second-place finish in PRO 2, a third-place finish in PRO 4, and a second-place finish in Saturday’s PRO 4 final. 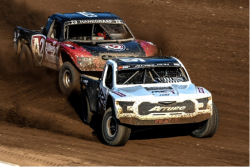 After suffering two flat tires in the PRO 2 final, Carlson gave a master class in race driving—charging from the back of the pack to cross the finish line second, albeit a lap behind. With no possibility of a podium, he could have easily coasted through the rest of the race, but instead chose to demonstrate true determination and competitive spirit by forging ahead in spite of his one-lap disadvantage. 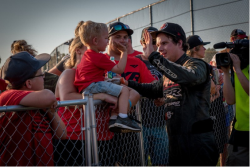 “We came in as the top qualifier,” Carlson commented, “but I got two flat tires almost immediately. 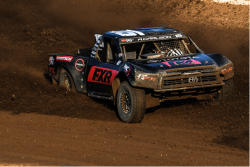 I had to hot pit twice and that put me a lap down and at the back of the 12-truck field.” Despite the devastating setback, Carlson chose to take the opportunity to hone his skills—and received great enthusiasm from fans, who were delighted to see their local racer give a truly impressive lesson in passing technique. An avid outdoorsman, Andrew Carlson has also been assisting K&N in launching the new K&N Outdoor program, designed to help dedicated outdoorsmen get the most from the vehicles that carry them on their adventures. Whether you’re a fisherman, hiker, camper, or explorer, K&N offers performance products to help keep your recreational and utility vehicles performing at their peak. You can look for Andrew Carlson at the Bark River International Raceway in Bark River, Michigan, August 10-12. Follow the Carlson Moto Team throughout the season on their website www.carlsonmoto.com.